By default, only users who belong to the ‘administrator’ user role can view the email logs. Administrators can grant access to email logs to users who belong to other user roles. To mange the access for other user roles, log-in as a user who belongs to ‘administrator’ user role and hover over on the ‘Email Log’ menu and click on the → ‘Settings menu’. 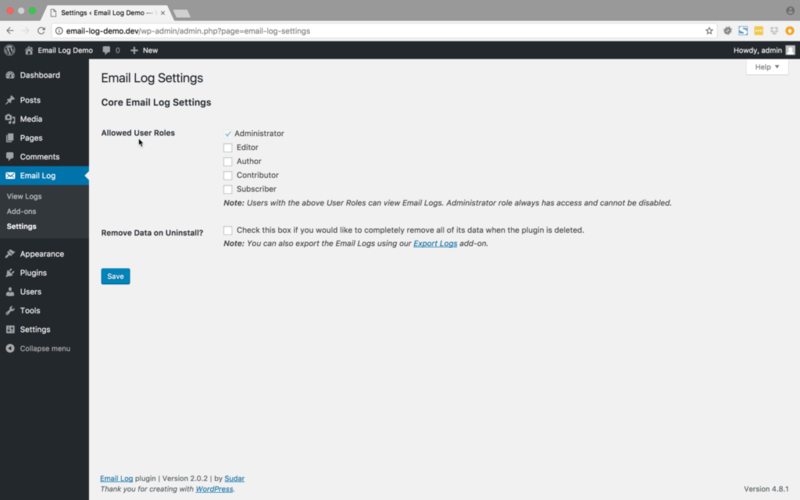 This will bring up the settings screen (screenshot below), where the access to email logs for different user roles can be configured. In this screen, select the user roles for which you want to grant access and click on the ‘Save’ button to save the changes. Once the settings are saved, the users who belong to the selected user roles can view and access Email Logs. To remove access to a specific user role, uncheck the user role and then save the changes. Please note that this access can’t be removed for users who belong to the administrator user role.